Touch is not the only medium of interaction. Intuiface is uniquely engineered to work with virtually any interactive approach you can imagine. Intuiface is the market leader in no coding, touch-first content creation so it might surprise you to know that its focus is on interactivity of all kinds, not just fingers on a screen. From speech recognition and beacon technology to the Internet of Things, Intuiface is there, putting even the most complex technology in the hands of the creative in all of us. With beacon support, your Intuiface experiences can uniquely identify select items, be notified when approaching an item, or broadcast URLs in response to user choice. Create lift-and-learn scenarios for your store or personalized browsing experiences for your museum. Similar in concept to beacon technology, RFID/NFC systems uniquely identify tagged items. Intuiface can communicate with any RFID/NFC reader, using the captured identity to show individualized information or trigger any of 200+ possible actions. The Internet of Things is the universe of network-accessible devices that can send and receive information, everything from room lights and thermostats to your refrigerator. Intuiface can communicate with and direct all of these devices in real time. Intuiface supports use of the spoken word, capturing information or reacting to commands activated from Amazon Alexa or Google Home with any of 200+ possible on-screen or behind-the-scenes actions. Crucial for creating accessible experiences for those who can't effectively touch the display. Proximity and motion detectors - like Phidgets - can alert Intuiface to the presence or approach of onlookers. Use them to trigger events that capture audience attention and draw them in for further engagement. Tangible objects are items whose presence and orientation can be detected by a display. Intuiface can react to these objects - aka object recognition - on any display/middleware combination supporting the TUIO protocol, treating them as unique identifiers as well as points of interest for displaying interactive content. "To both thrill and satisfy an audience, you have to give them what they need, not just what they dream. Touch is the necessary minimum but there is so much more." Technology from companies like Quividi identify age, gender, group size and more in real time. Intuiface can work with these third parties to both capture information for analysis and to be triggered to present each visitor with uniquely personalized content and behavior. With Intuiface you can map key presses to any of over 200 supported actions including turn page, play video, and maximize image. Combined with other interactive options, touch experiences become accessible for the physically and visually impaired. Intuiface supports on-the-fly conversion of both static and dynamic text into speech for the visually impaired. Designers can configure both the voice and speed, using any language available on the target device to ensure proper clarity and intonation. Yes, even the poor mouse gets its due. With Intuiface, think of the mouse as a single finger. And it's a good thing because this means your non-interactive displays still have a lot of good years ahead of them. 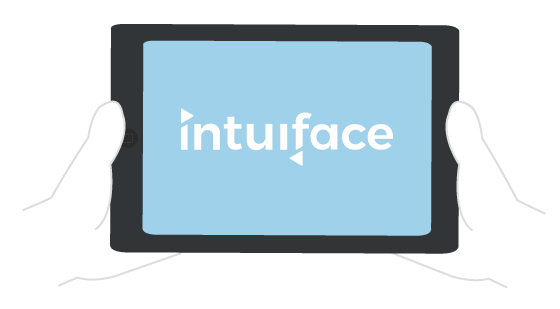 Intuiface experiences can communicate with one another across any network. Triggers in one experience launch any of 200+ actions in another. And a remote action API enables 3rd party apps to control / be controlled by Intuiface experiences from afar. Intuiface can take any URL as input and display the corresponding QR code. Enable Mobile Activation by creating take-home information on the fly without knowing in advance which information will be requested. Perhaps use this in combination with Intuiface's beacon support! *Some features are exclusive to Windows.